Advent is the four weeks before Christmas. It’s the season when we get ready for the coming of the Christ Child – Jesus, God in human form, both fully human and fully divine. Traditionally, Advent is a time of waiting and watching for signs of God’s presence in and around us, and God’s work changing the world one heart at a time. This year, Advent starts on Sunday, Dec. 2; worship is at 10 a.m.
Amid the crazy consumer frenzy of commercialized Christmas, PEACE Lutheran Church offers an antidote. We invite you to carve out a few minutes each week this Advent season to take a break from the holiday rush and reflect on the true meaning of Christmas: celebrating the coming of Christ. Free mini-concerts offer relief from the rush every Wednesday before Christmas starting at 5:30 p.m. in our spacious and serene Sanctuary. There, you can relax and meditate while musicians interpret great music from across the centuries and musical genres. Members of the Colla Voce Youth Chorus surround director Anne Vaaler. They perform Christmas music in a free concert at 5 p.m. Wednesday, Dec. 6, at PEACE Lutheran Church, 828 W. Main St., near downtown Grass Valley. 5:30 p.m. Wednesday, Dec. 5: Colla Voce Youth Chorus will enchant you with the beauty of their voices! 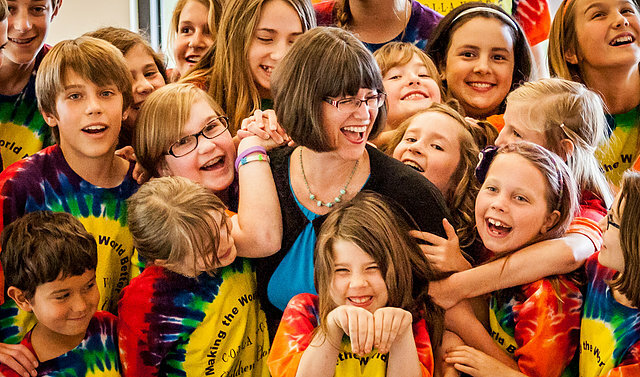 Under the direction of Anne Vaaler, one of PEACE’s worship music leaders and a local teacher. 5:30 p.m. Wednesday, Dec. 12: Bells of Peace handbell choir. These hand-wrung bells fill the Santuary with their vibrations! 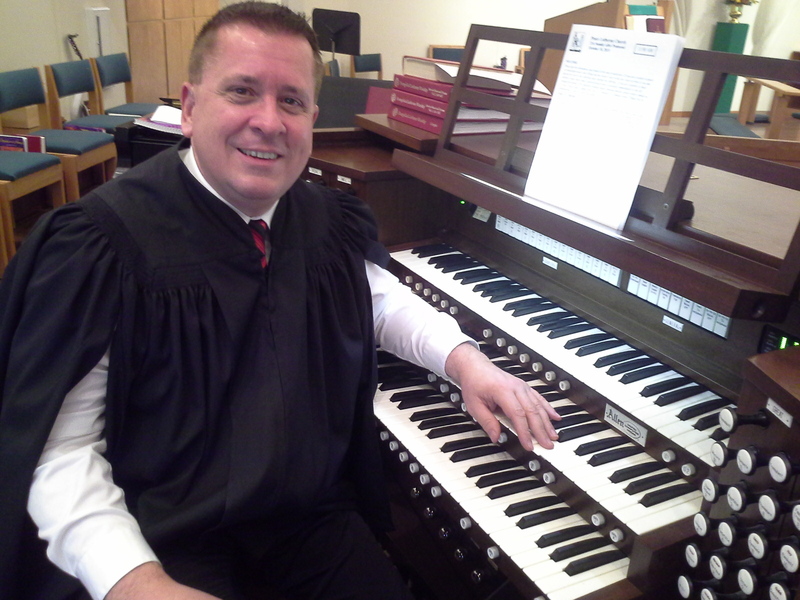 5:30 p.m. Wednesday, Dec. 19: PEACE’s staff organist Walt Strony and Emmanuel Episcopal Church Music Director Thomas Greathouse will fill our Sanctuary with moving and uplifting sounds of the season. After each mini-concert, we offer a moving and uplifting prayer service. It follows the format of Holden Evening Prayer, which is full of beautiful music and singing. Vespers starts at about 6 p.m. each Wednesday in Advent. Organist Walt Strony plays during free mini-concerts leading up to Christmas at PEACE Lutheran Church in Grass Valley. The season of Advent marks the beginning of a new church year. Many Christian churches observe a calendar of church seasons that mark key moments in our faith history. Like the earthly seasons, these church seasons also guide our spiritual growth. The word “advent” comes from Latin, meaning “coming into being.” Since the 5th century in what is now France, people have been observing this time as a season of prayer and meditation as they prepare for Jesus’ arrival. During this time, many households have Advent wreaths. Candles remind us of the the light Jesus brings to the winter-darkened world. We light one candle during the first week, two candles the second week, and so on until Christmas Eve. If you would like a special devotion to use at home for lighting your Advent wreath, just let us know. If you use the “Bread for the Day” devotion, Advent prayers are included. Colorful Advent calendars are another way to keep our focus on the coming of God’s Son. Advent is the season when we know something is coming. We better get ready for it! To do that, we have special readings from both Old and New Testaments that describe waiting, watching and what will happen. 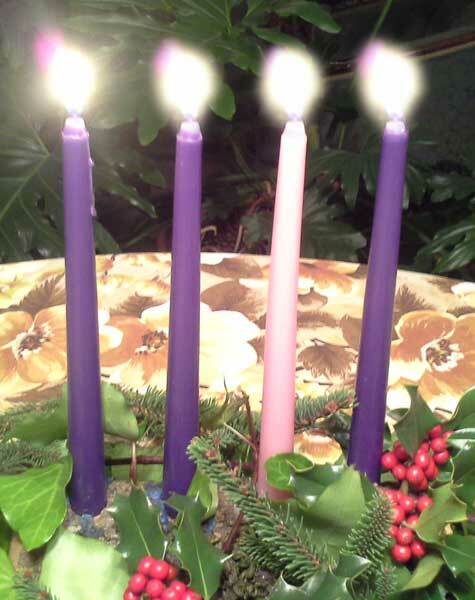 Four Advent candles help us remember the lessons of this season. We light one additional candle each week to remember Jesus is coming, and he brings us Hope, Love, Joy and Peace. God’s people have a hard time staying faithful during hard times – God knows that! So He sends us counsel for getting through them. Jesus tells his followers to be alert. The apostle James urges us to be patient. In the meantime, we are called to notice the signs that God’s Kingdom already is breaking into the world, here and now, amid all the hubbub. Advent reminds us to look around and see the signs of God where we live, work and play. It reminds us to get ready to meet Him wherever He might show up – in the face of a rascally kid, a grumpy neighbor, a weary co-worker, a drug-hazed homeless person. The season of Advent is a sign that Jesus is near to us! At PEACE, we invite you to feel His presence in your life today!